Given Americans’ craving for hop-forward beers—by 2015, IPAs as a category had grown to almost ten times their 2008 levels—suggesting brewers make beer without hops sounds like treason. But the researcher looking into hop-less beer, Charles Denby, actually loves hops. He’s an avid homebrewer and a biochemist at the University Of California, Berkeley, and he’s created a strain of brewer’s yeast that claims to produce hop aroma and flavor—without any hops in the beer. The New York Times details his research, which was recently published in the journal Nature Communications. If you don’t want to sift through the full analysis of monoterpene synthesis and linalool production, here’s the gist: Denby was working on biofuel experiments when he learned that some plant molecules called terpenes can replicate the flavor of hops. These terpenes occur naturally in herbs like basil and mint, so Denby injected some basil DNA into brewer’s yeast and tested whether it successfully recreated the flavor of one of craft brewers’ most commonly used hops: Cascade. The results? It worked. 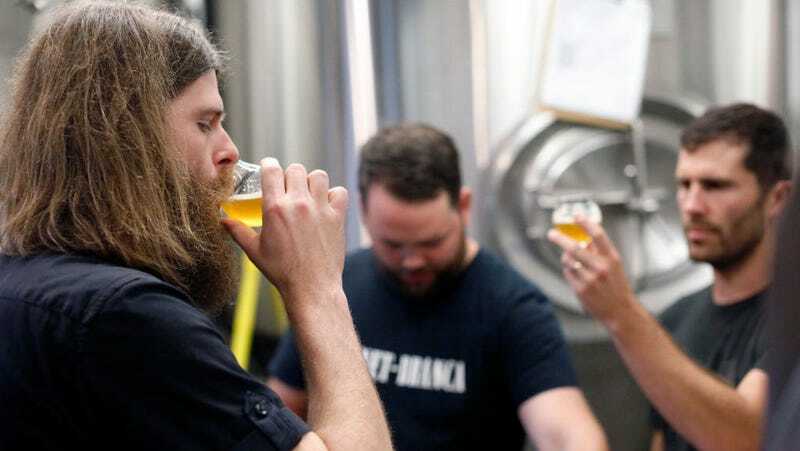 Employees of Lagunitas Brewing company in California were asked to blind taste beers made with the hybridized yeast—and no hops—against conventionally brewed beer. The majority indicated that the engineered beer had higher perceivable hop levels than the standard beer. Denby is far from releasing this technology on a commercial scale, and numerous questions remain: Does the terpene-producing yeast also give beers the same levels of hop bitterness, or just flavor? Could the yeast be modified to mimic other hop varieties besides Cascade? The NYT reports that two of Denby’s aims are to reduce the high quantities of water required to irrigate hop fields and to present a potential solution to hop shortages among craft brewers. Read more about the future of hop-less IPAs over at The New York Times.